Once again, Rain is confirmed pregnant to our gorgeous jet black stallion “BVF's Jedi Knight ” and is due April 20th 2019. Rain is a double certified RMHA/KMSHA grulla (black dun) mare, (DOB 05/03/10), a very rare colour in the Mountain Horse breeds! She stands 15.0hh with a compact, but powerful build. This petite girl is very feminine and beautifully put together too! Rain has textbook dun markings; including a dorsal stripe along her back and zebra striping up all four legs. She has a charming, delightful personality, and an extremely inquisitive nature. Her bloodlines include the famous stallions “Kilburn's Chocolate Sundown”, “Sam Clemon's Tim” and “Tobe”. This gorgeous girl is one heck of an eyecatcher! Rain is a gorgeous mare with lots of style and pizzazz! She has an incredibly smooth extremely natural gait, a wonderful collected canter, and a beautiful head carriage too. Rain is one of the most naturally athletic horses we've ever had the pleasure of working with here at Bonnie View Farms! Like all of our breeding mares, Rain is not “just a broodmare”, she is a well trained riding horse too. Rain received a solid training foundation long before joining our breeding program. As with all horses in our training program, Rain has been taught to be equally as accomplished on the trails as she is in the show ring. She is skilled in her back-up, neck & direct reining, lateral work (leg-yielding, side-passes, shoulders & haunches in/out, turns on the forehand & hind, etc.). Rain works safely around cars, ATVs, and “spooky animals” (dogs, birds, deer, etc.). She can gait easily over a variety of terrains, negotiate down steep hills well supported by her haunches, goes through water with out fear (has even been swimming over her head!). Even with all that, Rain will continue to be ridden while pregnant, right up until she becomes too big with her foal (last 3-4 months of gestation). Then she'll be right back to riding again, approximately a month after she's had her foal, with her foal learning to gait at her side following in her perfectly timed footfalls! Rain has many, many trail riding miles, she's also been over-night camping, ridden demos & expos, horse shows, clinics, riding lessons, etc. You name it this lady can do it!! 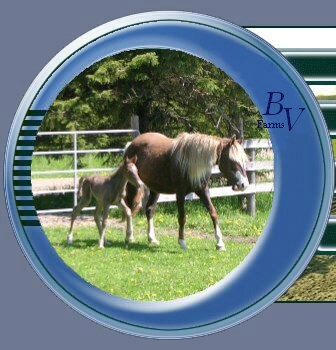 Rain's 2017 foal is a gorgeous jet black filly “Storm” by our gorgeous jet black stallion “BVF's Jedi Knight ” . Check Out All Those Dun Markings! Hand-Gallop With An Egg? Now That's SMOOOOTH!! And These Highlights ... All Natural!